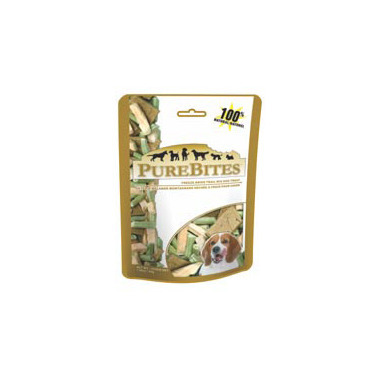 PureBites Freeze Dried Trail Mix Treats For Dogs are made with only 3 ingredients: 100% pure beef liver, sweet potato and green beans. Your dog deserves pure! I love many of the products from this company but both my dog and I were very underwhelmed with this one. There is very little sweet potato or liver and mostly green beans. Also the liver pieces are miniscule. My dog wasn't very impressed with the green beans and would always spit them out which was surprising to me as he adores raw green beans whenever I feed him some. After taking a better look it seems the freeze drying process transforms the bean into a paper thin shell that must not only taste very meh but also have a pretty unpleasant texture. All in all not very good value. I've since gone back to feeding him raw green beans and the plain liver pieces from Pure Bites. My boxer loves these treats! They do make your hands smell like fish (obviously) but they aren't as potent as some other fish treats we've tried. The price is great too for what you get! Great value for a 100% natural product!